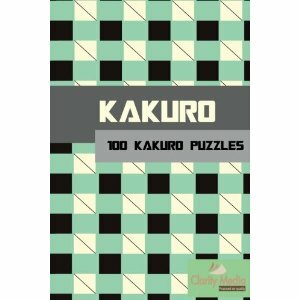 Welcome to this fantastic collection of 100 all-new kakuro puzzles, featuring a range of different grid patterns and sizes. The puzzles get gradually harder as you work through from the first puzzle to the last. - Place a number from 1 - 9 in each white square in the grid such that the sum of the white squares in each run of cells matches the total in the light grey square at the start of that sum. - Sums run either horizontally or vertically. A number cannot repeat within each sum. Thus if there is a sum total of 4 from two squares, it must be 1 and 3 in some order, not 2 and 2. That's it! Each puzzle in this collection has a single solution that can be reached through considering the number options for each square: you'll never need to guess to solve these puzzles. Kakuro is an interesting puzzle. Sadly, it never really took off in newspapers in the same way that sudoku did - in the West, at least. This has largely been blamed on people not liking maths puzzles, but others have suggested it is more because there is a higher entry point than sudoku, in that kakuro only becomes more fun after solving a few puzzles and getting used to the break-in points. The biggest solving tip for kakuro is simply to start learning some of the combinations that appear most often and realising that these greatly restrict the options. For instance from two squares, if the total is 3 then you know it must be 1 and 2 and if it is 17 then you know it must be 9 and 8. This one is obvious, but the biggest tip is to print off online a list of all the combinations that are possible and use these to narrow down options, particularly whilst solving your first 20 or so kakuro puzzles until these start to become comfortable for you. Once you have mastered those combinations, then tackling larger puzzles becomes bearable and even - dare we suggest - fun! Using the combinations, cross-referencing, and a little 'if this then...' logic you can solve even tricky kakuro puzzles. 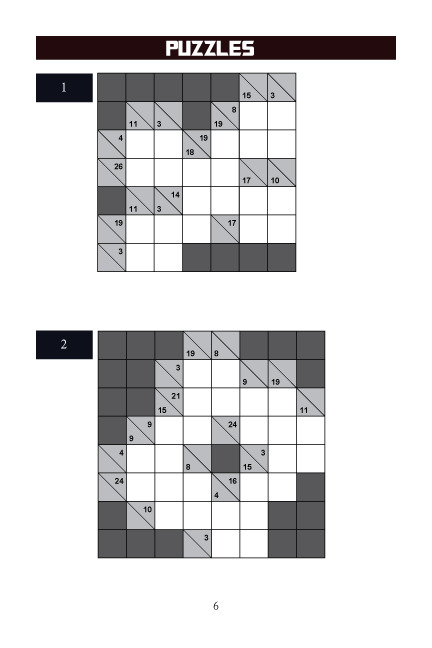 All the kakuro puzzles in this book can be used with the standard kakuro solving logic: there is one solution and it can be used through a combination of the sudoku rules that apply to kakuro (such as a number not repeating in a region) and working out the possible options for each run. Remember too to pay attention to the two different sums that a square must belong to: these can often be used to restrict the options too. Generally then, look for runs that must contain high or low value squares, and use these to start breaking in to the puzzle and reducing options. Leave the sums that have the most options until later in the solve process - by doing this and using the lists of sum combinations, you will put yourself in great stead to solve even hard kakuro puzzles - good luck!